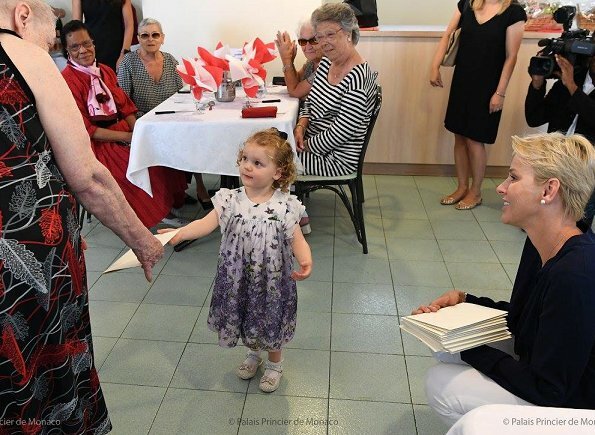 On August 19, 2017, Princess Charlene with her twins Princess Gabriella and Crown Prince Jacques of Monaco visited the Bellando de Castro elderly home of the Hector Otto Foundation in Monte-Carlo, Monaco (This page updated with new photos). How utterly adorable! Charlene looks supremely happy and the twins could not be cuter. Gabriella's lilac floral dress is beautiful. 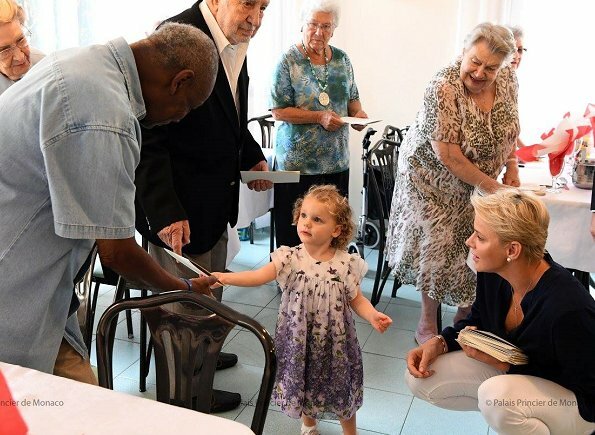 And what a nice thing to bring the little ones to visit the elderly. The twin's faces are priceless! Gorgeous children! I love her much softer look with lighter make-up and easier-styled hair. The kids are getting to be a heavy load to both be carried at the same time. Probably the best picture of Charlene ever. She looks so happy and have such a nice accessories! Jaques is picture of grandfather Rainer and gabrielle looks like mom. So cute. Gabriella looks like Hollywood child from 50's cinema... little Shirley Temple. Certainly Grace Kelly genes. Agree. There is something very classic about her face. 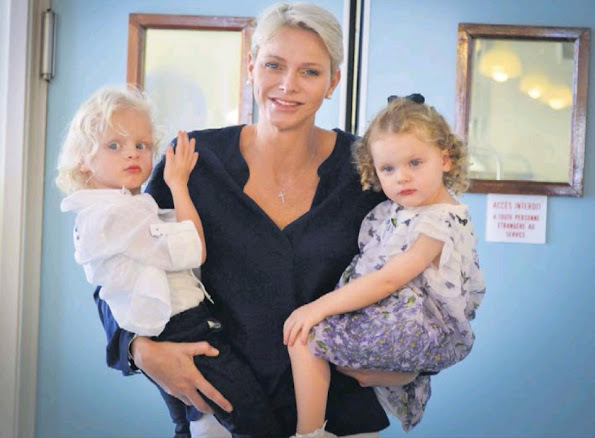 Lovely picture of mother and twins and very sweet to take the children to visit the elderly, well done Charlene! What a beautiful photo! It radiates happiness. Charlene looks so happy and the twins are gorgeous. WOU ,WOU,WAT EEN PRACHTIGE FOTO,WAT IS ZE TOCH GELUKKIG,MET HAAR GEZIN !!!! Quelle belle photo ! Charlène est resplendissante, les jumeaux adorables. Gabriella est craquante, une vraie petite poupée. Nicest photos of Charlene ever, I think. Wonderful, wonderful. Relaxed, happy and proud of her little munchkins who are so squeezably cute. Love Gabriella's pretty dress and how she's helping out. In these marvellous photos Charlene looks so happy and relaxed, especially in the photo where she has her hand in her hair and that infectious smile. The way that she looks at Gabriella giving the photos says it all! It was lovely to bring the children to this event. The residents would have really enjoyed seeing youngsters. What a strong lady to be able to hold both of the children at once! Lovely to see them (children) help in 'service' to the public. Lovely photos. 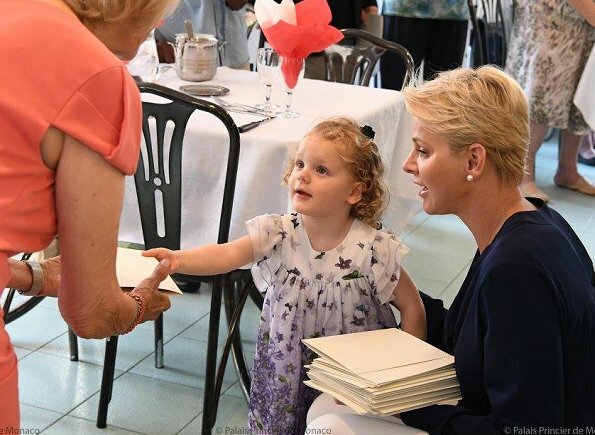 Princess Gabriella is adorable, and I like her beautiful dress. How nice to see Charlene so relaxed and happy!